Thank you very much for the work that you have done with Mr. Arizona. I will admit that I thought you would not be able to break him of his dangerous habit of bucking off his riders. 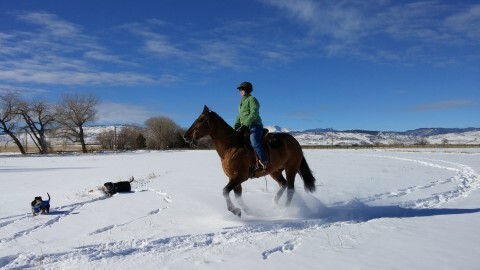 He has bucked off every rider since we owned him, including a very accomplished horse trainer from Wyoming. When Claudia and I saw what you have accomplished with Arizona in only a couple of weeks we were truly amazed. We now feel that Arizona will be the great riding horse as well as the leader of our herd which we envisioned when we acquired him. You are an amazing horse trainer and have a wonderful understanding of horses. 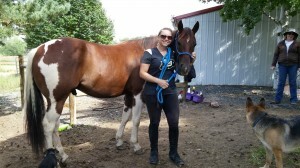 My trusty steed, Gentleman Jack, and I are the newest additions at Eden’s Aspens and I’m disappointed in myself for not looking for a place like EAH sooner. I have had Gentleman for over a year and a half. A few months ago I realized that our relationship was stuck and we weren’t growing together like I had hoped. I looked at nearly 30 barns to find “the one” that would be the best fit for us both. After several disappointing websites, terrible site visits and less than stellar phone calls, I discovered Eden’s Aspens! Now, two months later, both Gentleman and I are closer than ever and growing our bond every day. This is mainly due to the mission of EAH to build your bond with your horse from the ground up…starting with the importance of groundwork. My old barn’s theory was to get on the horse and ride. I never learned ground work and how important it is to build that partnership, and that partnership is THE reason I bought a horse in the first place. I’m a first time horse owner and now I am finally building my confidence around horses. I am learning the proper way to communicate with horses and what it truly feels like to have that connection with your horse. Shame on me for not finding this sooner. Eden’s Aspens is the best possible environment for a horse to be a horse and for a human to enjoy their happy horse. I was at the barn a couple days ago and mentioned how much happier Gentleman was here and how much he had changed in this short time. Autumn smiled, turned to me and said, “and you’ve changed too…you’re also much happier and relaxed.” I laughed it off and mentioned it to my fiance that night. He laughed too and said he noticed the same thing. He said how lucky I was to have found EAH. I now spend my days dreaming about the potential Gentleman and I have together to do shows, liberty work and just plain old trail rides together…the possibilities are endless with Autumn to help guide us along our path! I wanted to write you and thank you for the lessons my children have had with you. I can’t begin to tell you what a wonderful experience all three of us have had at your ranch. The lessons have been professional, thorough, as well as a great time for my two children. I was nervous at first, but seeing your facilities and meeting with you, it put me at ease. When the kids finished their initial lessons, I couldn’t imagine going anywhere else. I appreciate your emphasis on safety which was first and foremost. I also appreciate your love for the horses and the kindness towards them that you instill in your students. Everything you teach only reinforces responsibility, respect, a positive attitude and so much more in addition to the great riding skills you also teach. I look forward to a long lasting relationship with Eden’s Aspens Horsemanship for both my children and myself. 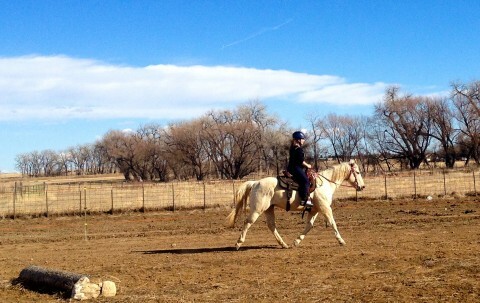 Autumn’s horsemanship teaching style is patient, consistent and straight forward. 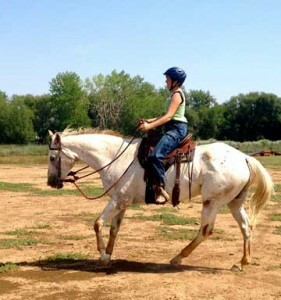 She offers challenges to both horse and rider with timeliness. If you’re looking to learn horsemanship as well as to understand yourself on a deeper level, I highly recommend working with Autumn at Eden’s Aspens Horsemanship. Autumn Haney is a gifted horsewoman who has helped me to develop a wonderful partnership with my horse. Her knowledge, combined with her intuitive knowing of the horse, create in her a teacher that can support me in all areas of learning in the arena of horsemanship. Her lessons answer my questions, take me to the next step, and support and challenge me. 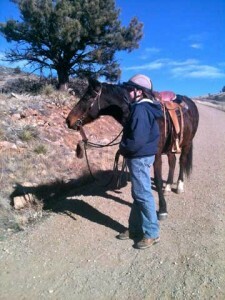 The trail riding gives my horse, Star, and me the chance to practice in new settings. Not many teachers offer the complete program that Autumn does. As the manager of the barn, I trust her completely in the care she provides for Star. Autumn is hard working, conscientious and dedicated to her profession. I feel very fortunate to have her as my teacher. When I was looking to board my best friend, Toy, I knew that not just any facility would fit. When I pulled into Edens Aspens, I was thoroughly impressed. Not only is the facility kept in excellent condition but so are the horses. Everyone, young and old, looked great and I could tell they were happy. Fields to graze and run and plenty of hay when kept in. 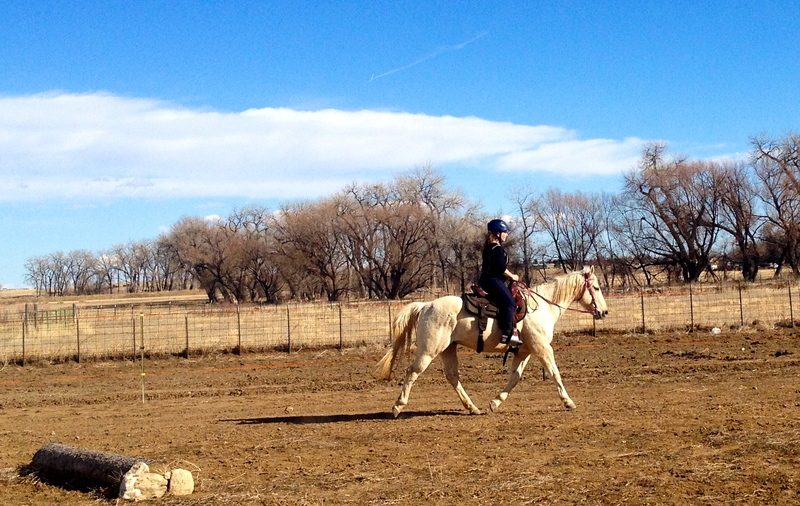 I love the community of boarders that Autumn has built and her philosophy of horsemanship. I know that Toy is in good hands and that peace of mind is worth it’s weight in gold. I wouldn’t have him anywhere else! For years, I have been looking for the right trainer to help me with horsemanship and riding lessons. I was very clear that, first and foremost, I wanted to develop and grow my relationship with the horse based on trust, heart and respect. After an hour watching Autumn with horses, I knew she was the teacher I had been looking for. She truly understands the way horses think and communicate. Her insight extends to people as well, and she relays the interplay between horse and human with kindness and clarity. I can see my leadership, relationship and communication skills growing after just a few sessions with Autumn. In addition, she has a talent for matching horses and humans. I’m excited to continue walking this path with her and see where it leads. The thing I appreciate most about Autumn is her ability to “read” not only horses, but people. I have some physical issues which are keeping me from doing some things I’ve loved in the past – including hiking and dancing. But riding seemed like it might not cause the same problems – and it didn’t. When I started with Autumn, it was all I could do to walk out to the pasture to catch Jack. But I kept at it, and after awhile, with Autumn’s encouragement – I could do it. Going out in the pasture by myself, for the first time with all the horses, was pretty intimidating for someone new to horses! But now I’m riding Buddy, and when I go out to get him, half the horses in the field come over to say hello – including Jack 🙂 Now it’s so easy, and so much fun. But it took a lot of work for me to get here, and Autumn has worked at my pace to help me move to the next level. I have found that riding at EAH has been very therapeutic for me, which has led me to volunteer at Colorado Therapeutic Riding Center. For me, discovering horses has been a way to change the direction of my life. I know that many people find great comfort in relationships with animals – dogs, cats, chickens, goats, etc – now is my time to find comfort in horses. 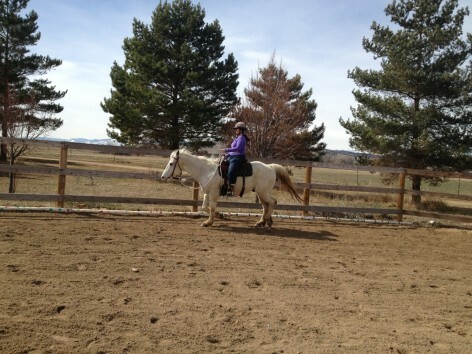 I came to Eden’s Aspens looking for happiness in horses – and that is exactly what I found. I had the pleasure of meeting Autumn as a customer of my saddle shop, Saddle Up in Longmont, CO. I rode horses as a young girl and had not ridden in years. While I have learned a lot working with my dad at Saddle Up doing my own research and from our customers it’s just not the same as the understanding you get from actually being in the saddle. I had been very hesitant to start lessons due to very bad back problems. At Saddle Up, I tell folks that my dad is the ol’ cowboy and I’m the business girl. 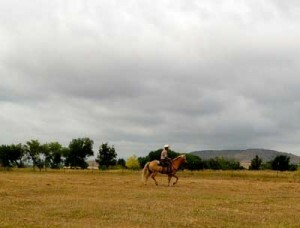 However to get a better understanding of my customers needs I knew I needed to take lessons and get back in the saddle. I needed a trainer that I could trust and feel very comfortable with. If I decided to take lessons I had to be put at ease and work with someone that could coach me along at my pace. When I met Autumn I could sense her values of natural horsemanship, when I spoke with Autumns clients they gave her rave revues, their eyes truly shined when they told me all Autumn has done for them and their horses. Owning a saddle shop has given me the opportunity to meet many different trainers and their clients. Autumn stood out to me as someone that could meet me on my level and not push me faster than I could handle. I was right; Autumn has been a great fit for me! Thanks to Autumn I am enjoying learning the basics and I look forward to continuing learning how communication works through horse and rider. Autumns’ style of training has given me confidence and that moment you “get it” has been a great self esteem booster. Thank you Autumn for being you and sharing that gift with others.